DUP leader Arlene Foster has warmly welcomed Theresa May’s fresh vision for Brexit – one that has no Irish border posts – but urged that the process be completed as soon as possible and with minimum EU payments. Mrs Foster was speaking after what is probably the Prime Minister’s most important speech yet on Brexit, which she gave yesterday in Italy. British prime minister, Theresa May, pictured during her speech in Florence, Italy on Friday. In it she said a smooth Brexit by the official date of March 29, 2019, was not possible, so a transitional period of two years would be required. She also re-stated there will be no physical infrastructure on the Irish border. Mrs Foster said it had been “a positive vision” but urged that Brexit proceed “without undue delay” and that future EU payments be minimised. The UUP’s Steve Aiken said the address helped restate the case for the Republic to build stronger relations with the UK, however TUV leader Jim Allister warned that a two year transition gives more time for “remoaners” to derail the process. The address was also described as “constructive” by the EU’s chief Brexit negotiator Michel Barnier, though he said clarity was still needed on the UK’s “special responsibility” for the effects Brexit will have on the Republic. 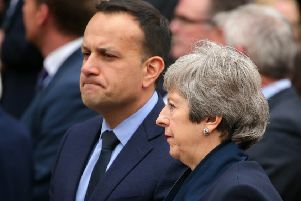 Irish Taoiseach Leo Varadkar also said it was a “genuine effort” to move things along, but Sinn Fein’s Gerry Adams said the address “failed to deliver or impress”.